That Sign is Not a Decoration! 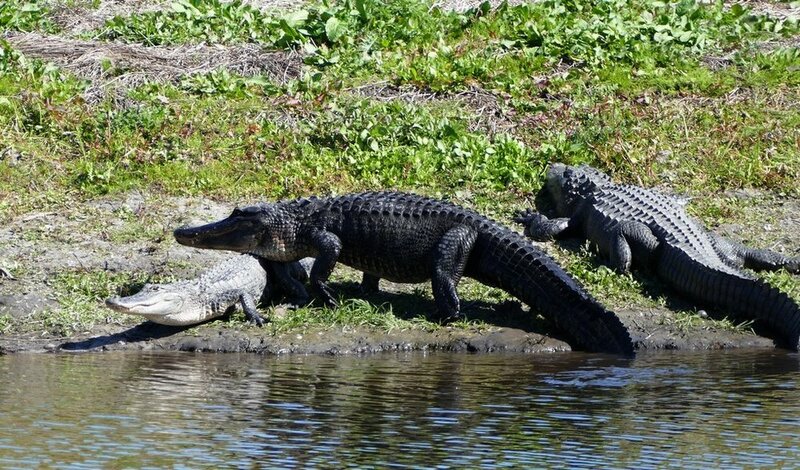 Throughout Florida there'll be signs warning visitors that although you may not see them, you should accept that alligators are present in or near all Florida fresh waters. It's too bad that these signs are read but not fully understood by those who didn't grow up with alligators in their backyards. If they did, they would realize that sometimes a Florida river may "appear" to have no alligators. 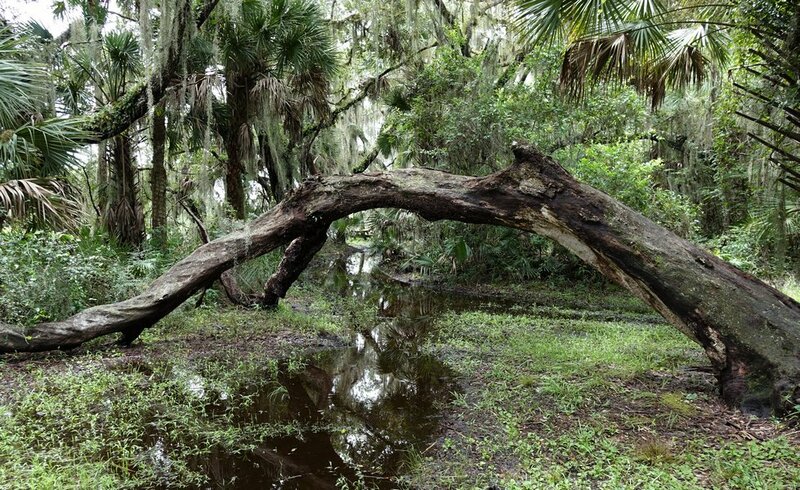 I notice that when I go to Myakka River State Park when the river is swollen, I don't tend to see the alligators out and about. But change the weather, make it a cold sunny winter day and suddenly you will understand just how many alligators are present in that river. Too bad I didn't get closer to the river to show you ALL the alligators that I was seeing. 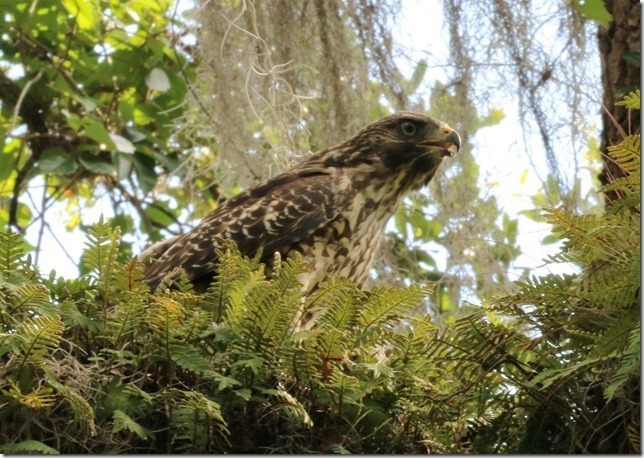 It was absolutely amazing to see how many of them call the Myakka River their home. Perhaps if visitors understood this difference, the chances that are taken around the river MIGHT be less so. About a month ago I happened to notice two couples kayaking the river. The men were doing the work and the ladies were enjoying the view. As the kayaks passed by me, I noticed one of the ladies would periodically let her hand drag behind her...IN THE RIVER...as she enjoyed a day on the river with her husband and friends. I couldn't help but wonder, "Doesn't she know there are alligators in this river??!" A year ago two college-age couples were enjoying a stroll along the river. The guys were wading IN THE RIVER, near the shore, trying to scare their girlfriends and the girlfriends were cooperating by squealing their fright. Again, I shook my head at the chances people take. Recently a Florida native told me that when he was a young man, he and his friends were doing some kind of "surfing" activity on a flooded Manatee River. Normally the boat they were using would scare off any alligators that might be present, but that day, it didn't. An alligator who had been displaced by the flood was lurking up ahead. He warned his friends of the alligator's presence. The boat veered off. The kids headed to safer ground but this guy was too far behind and he had to detour to a partially submerged tree. Quickly he climbed the submerged tree and straddled its trunk. Below him arrived the alligator...a very HUNGRY alligator. As the kid hugged the tree, praying he wouldn't slip or lose his grip, below him the alligator patiently awaited...mouth wide open as he intently watched this kid keep a death grip on that tree. Fortunately the boat was able to return and scare off the alligator and give this story a happy ending. Yes, we all take chances. We all do things that may be less than stellar. Even the wildlife skirt the boundaries of what they should and should not be doing. When I was at Myakka River State Park the other day, I happened to notice a rather close encounter between a vulture and an alligator. When I first noticed the duo, I thought the vulture was taking a chance being so close. The alligator looked poised to strike. Worried, I watched his tail for a twitch that might indicate the imminent sign of an attack. The vulture got closer and closer to the alligator. The alligator looked ready to spring into action. At least that's what I thought; however I misconstrued the alligator's intent. It turned out that the vulture must have been an engaging conversationalist. 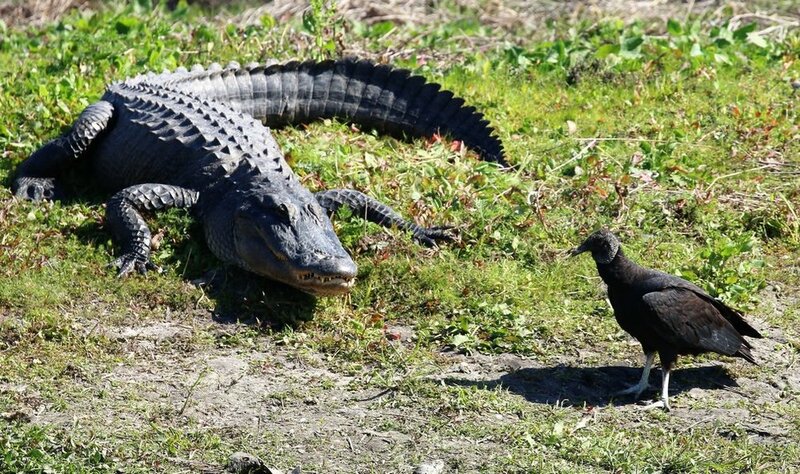 The alligator was totally mesmerized by whatever story the vulture was telling him and once the story was relayed, off the vulture flew. It's a good thing that vulture was such a good story-teller! As I wondered what the alligator would do once his "friend" had left, my atttention was next diverted to a nearby group of three alligators. A big one and smaller one were on shore and another big one was coming out of the water. 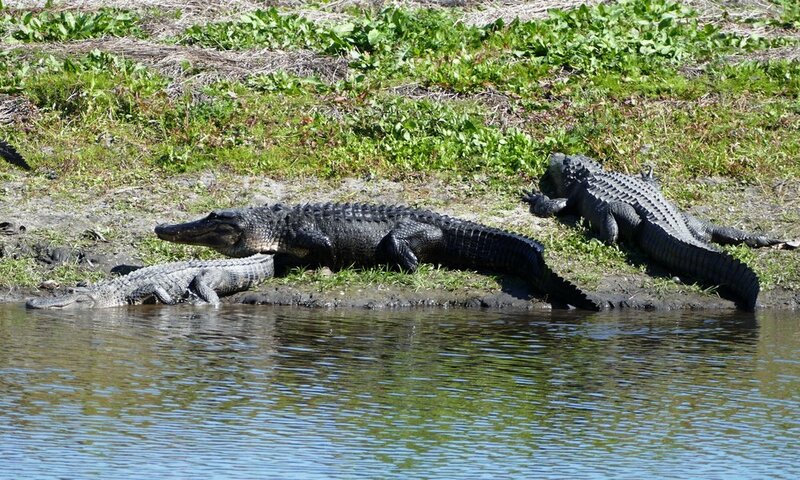 It looked as though the one in the water were heading for the other big alligator. "Oh, no!" I thought. "This can't be good." What a surprise I got on this one. He did not head to the big alligator! That alligator instead immediately made a move on the smaller alligator. If this was supposed to be a flirtatious move on his part, she was in no mood for his amorous attentions and she discreetly took her leave. 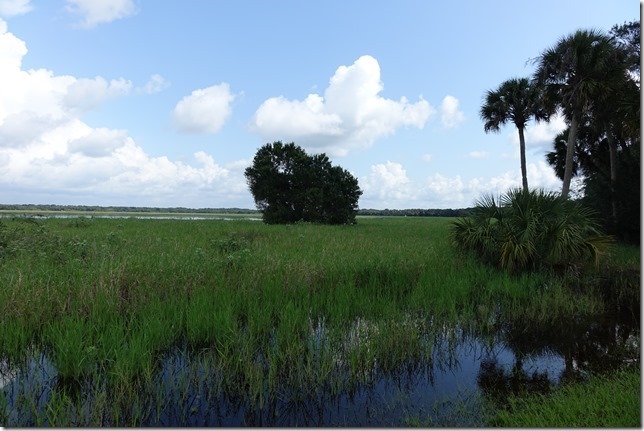 It sure is interesting going out to Myakka River State Park. I sometimes wish I would take a camp chair so I could stay longer and watch and wait for what comes along.... You'll meet lots of nice people and of course the wildlife are certainly something to behold! What a magical mystical place it is..... Hope you take the time to visit, but don't stick your toes or hands in the river!! Have you ever been in a stare-down with a cottonmouth? 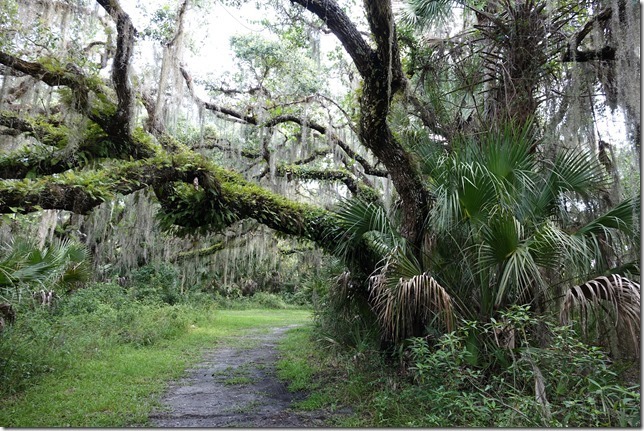 I know I haven't, but one of the visitors to Myakka River State Park claimed that he had. Larry and I encountered the "snake-charmer" as we were slogging our way to the bridge. He had already been down to the bridge and was warning us about the cottonmouth he had just seen and was also advising us not to go past the bridge. He had done that and ended up in chest deep water. YIKES! Apparently a vehicle had also attempted to drive down the barricaded road but the high waters in some sections of the road ruined his chance to go "orange-water" rafting. The truck flooded out and joined the other types of debris accumulating on the road. 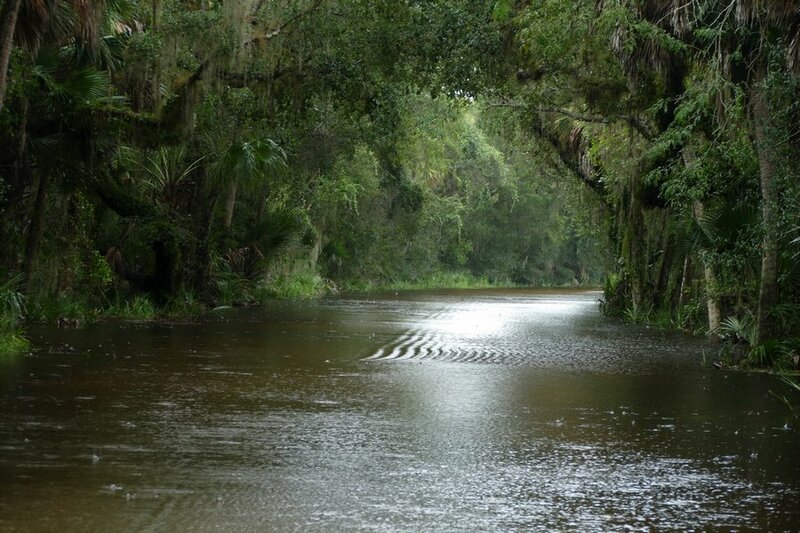 If you're wondering why I don't have a picture of that, it's because there is NO WAY I would slog through "chest high" water in the Myakka River State Park! I'm much more content to gaze in awe at how pretty the flooded paths have become. Although the inhospitable colony of ants live on the other end of this trail, we were quite safe from their stings standing by the BBQ pit near the picnic pavillion. At the end where the inhospital ants lay in wait, it's quite a difference what happened to their lair from one day to the next. 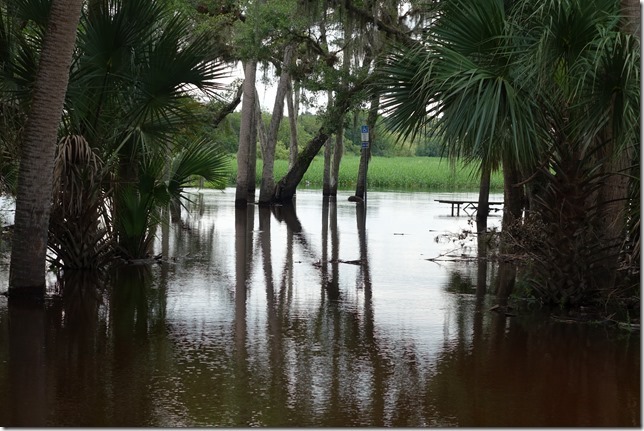 The Myakka River had risen another foot by Monday afternoon. The river had been a little over 8 foot on Sunday but by Monday the rise took it to 9.49. Most of the main road was closed to vehicles...unless you were the driver who "thought" his truck could make it.... The park was still open for visitors who didn't mind slogging their way down the main road. Visitors were asked to park near the restored log cabin. The beginning section of the road started out dry but it didn't take long to get to the flooded section. When we got to the flooded roadway, we stayed in the middle of the road where the depth of the water was only 6-8 inches. There is no way I wanted to be on the low side of the road and perhaps encounter that cottonmouth who may no longer be so "charmed" by our presence in his territory. The scenery was pretty on either side of the road. Woodlands or wetlands offered many photo opportunities. Because there was a current of water moving through the woods and pushing towards the river, occasionally downed branches or logs would be carried to the road and left there. We even saw small to medium size fish enjoying a swim on the road. 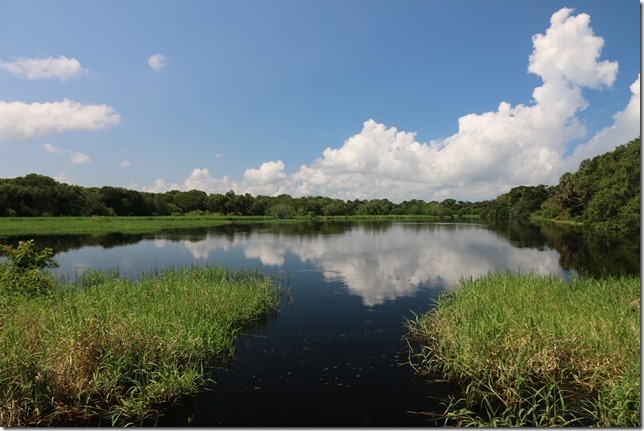 The wetland grasses were mostly under water and this section of the park seemed to "become one" with the river. It was not a good day to be taking pictures though. Rain came at times in buckets and it was a chore trying to keep the lens free so that I could take some pictures. Naturally we encountered several cute limpkin families and how I would have liked to have gotten some good pictures of them. The chicks seemed to be in different stages of growth. One chick had the downy feathers but my attempt at taking her picture was a dismal failure. I did keep one picture of an older chick walking along behind his Dad, but even it was not as good as it should have been. 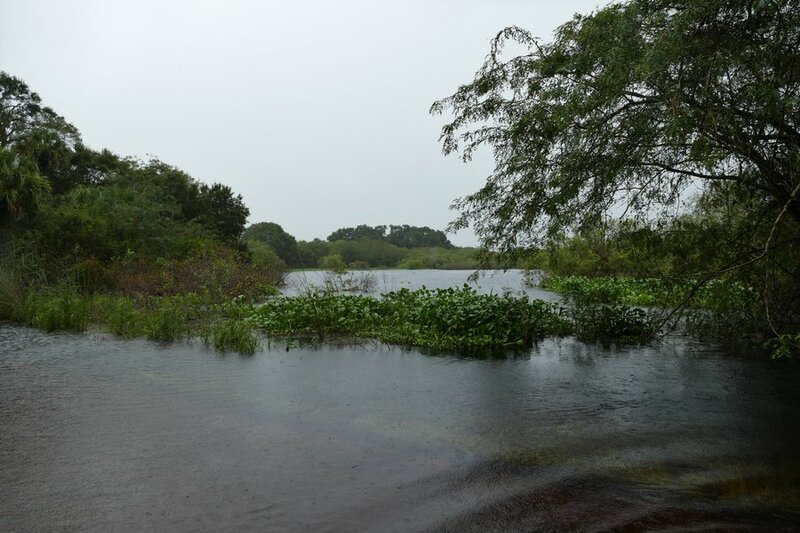 To give you an idea of what the weather was like when we made it to the bridge and came upon all the limpkin families, here's what the Myakka River and her banks looked like on Monday afternoon. 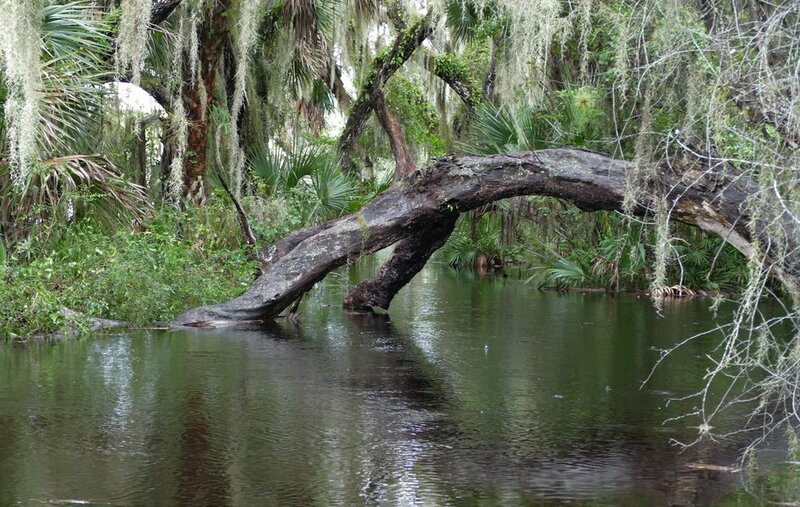 The Myakka River is still rising. As of Tuesday morning at 9:00 AM, the level had become 9.81 feet. The crest at this time was expected to reach 10.6 by Wednesday. Whether it achieves that level or goes over that prediction will be something that the homes will be surely watching. Homes become flooded at 11 feet. The flooded waters will be on State Road 72 at 11.9 feet. If you decide to go to the park to check out what's happening, remember your water shoes and camera! 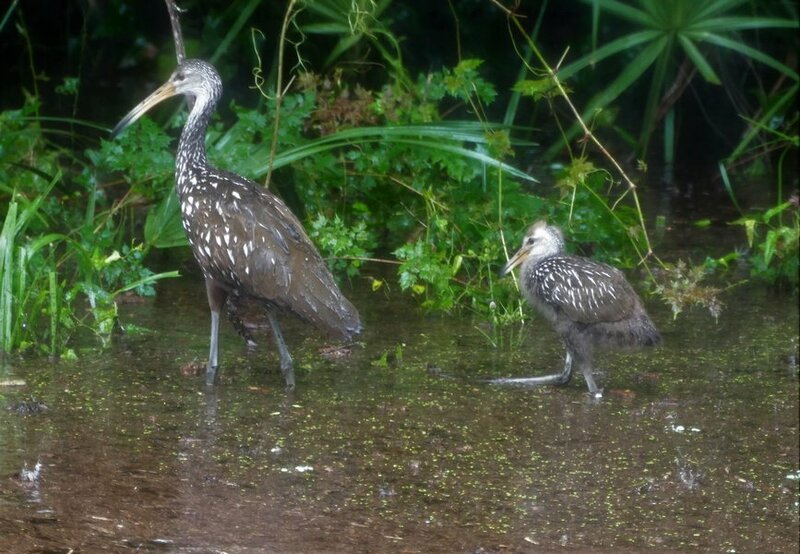 It's supposed to be a sunny day so maybe YOU will get that picture of the fluffy baby limpkin.